This is a test page for checking iOS system supported urls. It is a work in progress, I will continue to add links as I need them. Unfortunately wordpress.com, who host this page, suppress a few common url schemes including sms: and telprompt: so I’ll need to host elsewhere before it can be made comprehensive. Using a Table View is a quick and easy way to setup a great-looking, albeit simple, form in iOS. Table views provide a fair amount of free functionality including styling, titles, section groupings and scrolling behaviour. In this tutorial you will learn how to create a simple form using a static table view. In this tutorial we will create a storyboard and connect it to an existing iPhone application. Storyboards allow developers to visually implement application screens and flows. This is easier and faster than doing so in code. In this tutorial we will create a new iPhone project in XCode. I have been enjoying iOS7 beta since the WWDC back in June. While I planned to update to the official version, the last beta release was pretty stable so I didn’t feel any particular urgency. I figured I would do it soon and if I didn’t, apple would prompt (or even force) me to update over-the-air. What I did not expect was to find my device deactivated. Thanks Apple. There is no argument to be had about whether ARC is beneficial. The reduction of boiler-plate memory code, is alone, enough to justify its use. The elimination of issues resulting from objects being incorrectly retained or released also saves developers untold hours debugging weird memory management issues. However much ARC has simplified matters, issues will still arise if memory management is not adequately understood. These issues commonly fall into two categories, retain cycles and accessing released memory. 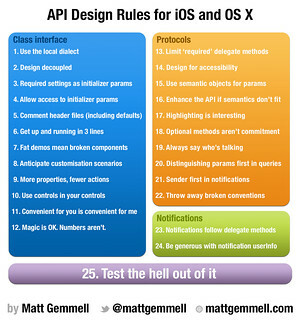 I recently read a brilliant article about API Design by Matt Gemmell. The suggestions Matt makes seem so straight-forward that it is easy to pass them off as common sense. However, many projects are not developed using these common sense suggestions. Clearly, this is a sign that there is much to be gained from formalising how APIs are written. Matt has also created a Cheat Sheet summarising his recommendations. A worthwhile read. Thank you Matt. The straight-forward way to add additional Simulators to XCode is via Preferences. 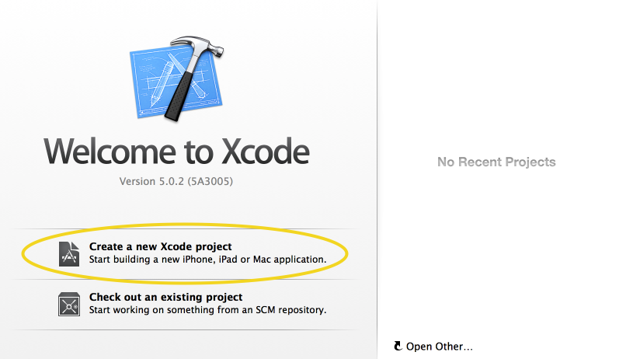 XCode 4.5.1 comes preloaded with iPhone/iPad Simulators for SDK 6.0 and the option to download 5.0 and 5.1. However other versions are getting little love. If you need to support clients on older versions of iOS this is a problem. 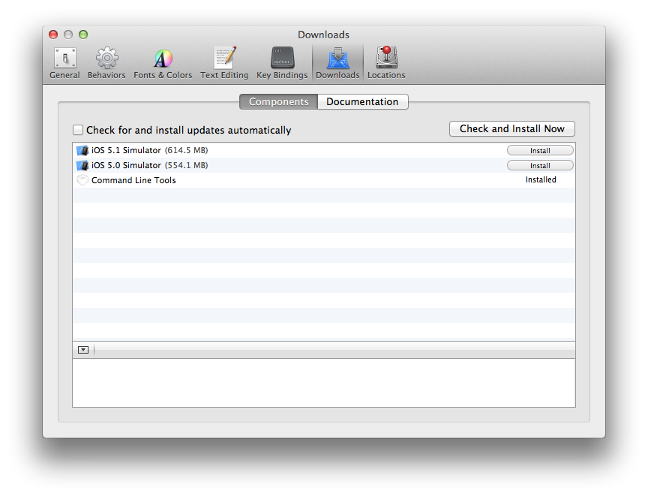 Luckily, adding older Simulators to XCode is easy. NOTE: XCode 4.5 has dropped armv6 support so can no longer be used to develop for iOS <4.3. 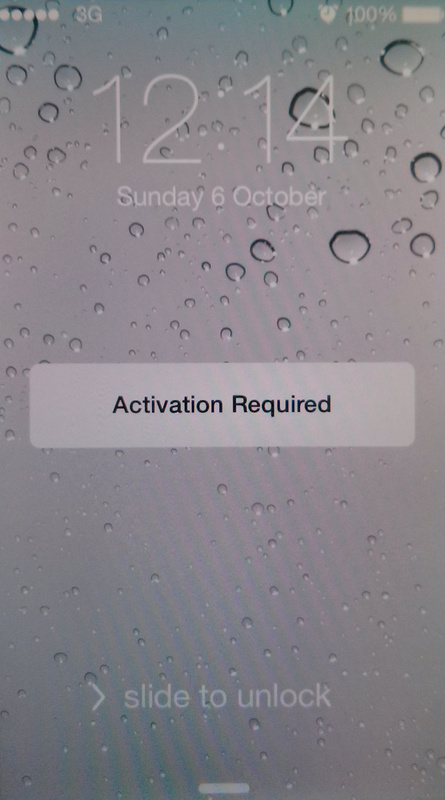 Adding armv6 simulators such as iOS 4.2 to XCode 4.5 will have no effect, they will simply be ignored.